In a poll conducted in 2011 on a very popular musky fishing website, Musky Tackle Online came out on top as the favorite tackle shop. We are both humbled and honored by this support during our early stages of growth. We have continued to expand and improve our shop in the years since then. Thank you everyone for your support! From a rookie muskie fisherman I really appreciate your help and great service! The order I placed on 01/14/2013 arrived today 01/17/2013, truely excellent service! It was great conversing with you via email and to let you know your competition still has not come through with their delivery for the order I placed on 01/06/2013. Needless to say I will be ordering only the things I absolutely need and cannot get through you, from them. I really appreciate all your help and can hit the water Saturday with several new lures. I found your website when watching Musky Hunter on TV. It was either that show or another Musky Show. Anyway, this summer I have placed 3 separate orders from you. The total of the orders was roughly $340. I just wanted to let you know how pleased I’ve been with your company. The prices are great. The shipping was fast. I received e-mails letting me know that my order was received and shipped. It’s everything I would want when ordering products online. I hope that you continue to grow and can add more products. I’ve told my friends about your site and hope they will also get the same service you gave me. Before going to other sites for Musky fishing products, I will always visit your site first. I was told about this site from my muskie mentor. I am just getting into muskie fishing and he told me to come to the site because of the great deals and great shipping. Boy was he right. I have made three orders from you and man this has to be the best online site for customer service, price and shipping. I was amazed when I ordered stuff on a Friday and woke up finding my package on my porch Monday morning. Never have I ordered something online and had it so quick. This will be the only site I used for my muskie fishing needs. Aaron thanks again. And thanks to my mentor for telling me about the site. I forgot to thank you for the INCREDIBLY fast and efficient shipping. This is the second time I have ordered from MTO and, I hate to admit, have ordered from other online musky sites 4 or 5 times in the past. After the slow and expensive shipping, as well as overpriced lures, I can assure you ALL my future orders will be placed with MTO. I also have "spread the word" to some of my other friends who have this sick addiction. I thought I would write you and compliment you on your excellent customer service, as well as the impressive manner in which you conduct your business. I just wanted to thank you for keeping your prices down and keeping Musky fishing accessible to more people. Your hard work, low prices, and great customer service make my musky tackle dollar go further. As a young guy with a family I appreciate that very much and will continue to visit your site for my needs. First off, I want to commend your staff for being so prompt on sending out orders so quickly. 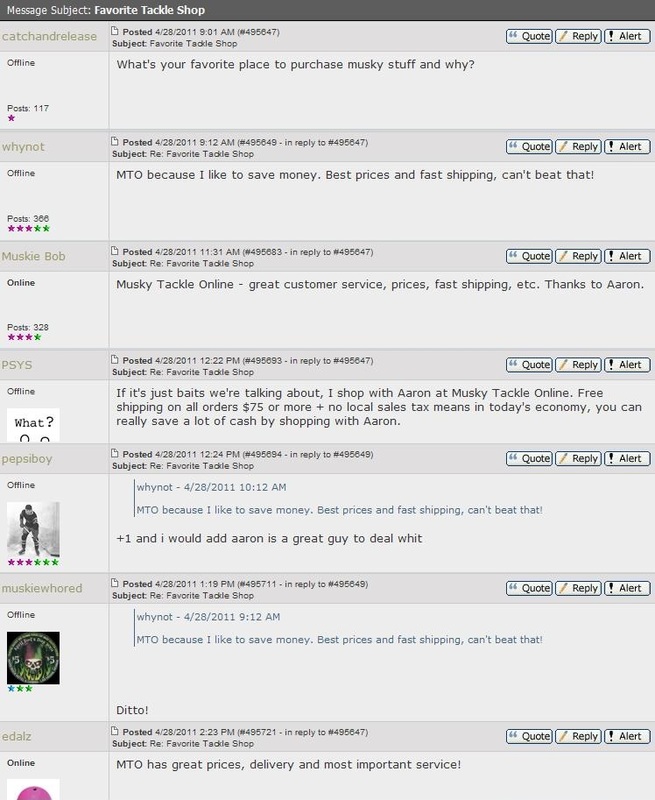 Muskytackleonline.com is the only musky online shop I've worked with that has moved so fast. It keeps me coming back to you on a regular basis. I'll continue to search your online store first if there's something I need. Thanks again and I feel confident knowing my baits are in the mail and most likely delivered before my next day out on the water. Keep up the great work and continue to bring more product in. I'll continue to be a loyal customer and keep spreading the word on where to buy musky baits online. Have a great weekend! I just wanted to you shoot you an e-mail saying thank you for running a great great business. I’ve placed a number of orders recently and there have been no snags, no surprise out of stock messages. I don’t know how you ship so fast but it’s unbelievable. Super prices and just an all around pleasant online buying experience. So I just wanted to say thanks for running a great business and I will be coming back as long as you're open. Keep up the great work!!! spread the word. Thanks again. I'm very pleased with your service. Really good prices, Super fast free shipping ( I've received my order in 3 days) and great communication make your store highly attractive. I'll most definitely order again and recommend your website to all my friends. Thank you, very much again. Wanted to let you know that my clients this past week love you...this one guy found you thanks to a friend of his and I guess you are very popular amongst their group. Very nice guys! Also wanted to let you know you are on the radar big time with some big guides...everyone is very happy with you. Keep on rockin, your business should be well on its way! As you can see, I'm hooked on your prices. Thanks for having sent my order so quickly (and free) and for having such good service. For whatever it's worth, I bought some lures from XXXXX (different colors than what you had) the same day I sent you my 1st order and I still haven't got them! Don't worry, I'm done dealing with them and I've told a few buddies about your service and website. When I started out fishing for Muskies, I did lot of research online and one website kept on coming up... It was Musky Tackle Online... I bookmarked it in case and just kept looking everywhere else... For whatsoever reasons, I kept on coming back to MTO... til one day it hit me... I could replenish my tackle arsenal rapidly if I ordered them from MTO... so I started doing that... and still am doing today... Later on, when I started hitting forums... 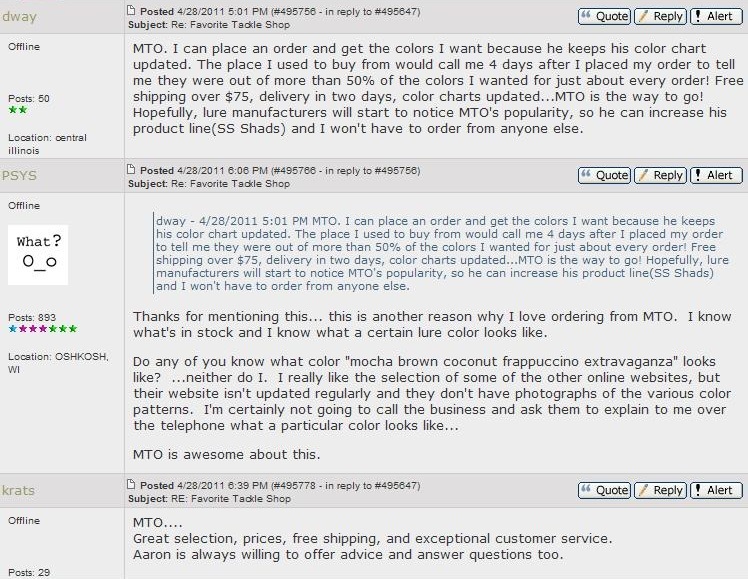 I realized that "AWH" had something to do with MTO... not realizing that he’s the owner til later on... wow excellent owner-customer rapport... that sold me big time... Aaron would help anybody out if they asked... gives out excellent advice... and very easy to work with... Pretty much he tries his hardest to get anything anybody wants... That along with his wonderful prices and quick shipping really is what keeps making me come back... His ability to make customers happy can be proven in a huge 10-months orders wish list I had composed in February including more than enough lures that needs to be special ordered... Aaron pretty much could do 99% what I asked... If I can remember right... 110 lures for those 10 months orders and Aaron couldn’t get 3 or 4... That’s a testament right there to what he could do for you... 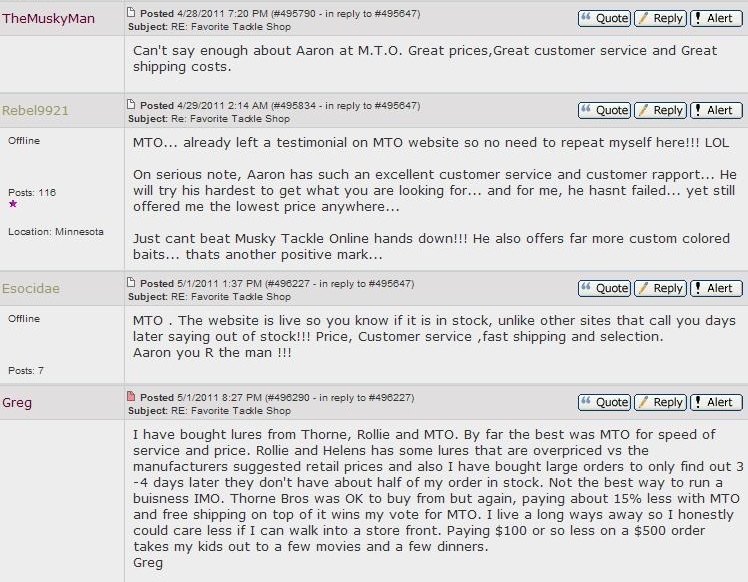 He does listen well to his customers, treats his customers excellently... and does save BIG for the customers... how he does that, I don’t know... but the way Aaron and MTO is going... He’s going to be around for many years... and he'll keep up the excellent service for many years too... Partial credit for me catching my first ever muskie goes out to Aaron... I ordered a few lures on a late Saturday... he couldn’t send them out on the following Monday because it was a holiday, but he shipped them out on Tuesday, fully aware that I needed them for my trip to Mille Lacs on Wednesday... well.. the lures arrived safely early Wednesday morning right before I left for Mille Lacs... in the package was a Pink/Pink Double Cowgirl that I had ordered... and that same Cowgirl caught me my first ever Muskie not 12 hours after the package had arrived... I've lost count on how many times I've placed orders with Aaron... but I can say that I'll be a lifelong repeat customer...Keep up the excellent work!!! You guys have been great to deal with! I'm spreading the word. No reason to shop anywhere else. I just wanted to let you know the service with your business is the best I have ever experienced and I really appreciate the speed at which you ship your products. Just wanted to say thanks for your fast service. My brother requested a specific musky lure as a Christmas gift and I was unable to locate it at any of the sporting goods stores I tried. I ordered from you late on Friday evening and the lure arrived already today. Thanks for the wonderful service! I recently purchased several musky lures from your company. I have got to tell you that I am 110% satisfied. Between not having to pay sales tax and no shipping charges, I was able to save quite a bit of money. Not to mention that you are the cheapest prices out there. Also, I have to commend the fast delivery (two days). I am glad that I found your website. I will be doing business with you in the future. I received my internet order yesterday and I wanted to thank you for the great customer service you have offered me since I started shopping your online store a few weeks ago. You have answered my e-mail questions promptly, you carry all of the latest baits that I was interested in, and the shipping on my order was super fast! Like I mentioned in my last message. I'll definitely continue to refer all my friends to your site. I wish you continued success in the growth of your business and you can expect to have me as a customer for years to come. It's nice to have a site where I can place an order, receive all the baits I've ordered in the correct patterns, and have it shipped to me faster than expected. Not to mention at a price lower than any other, PLUS free shipping. Can't beat that! With all of the musky fishing websites currently out there...none have made my shopping experience as easy and satisfying as it's been with your site. Take care and thanks again! There were many comments of support for MTO in the above online poll (comments below). It was very humbling to see anglers helping out their fellow anglers and explaining why they like MTO so much. We have grown a lot since that time and are always working to improve the shopping experience. Thank you to all for your support!